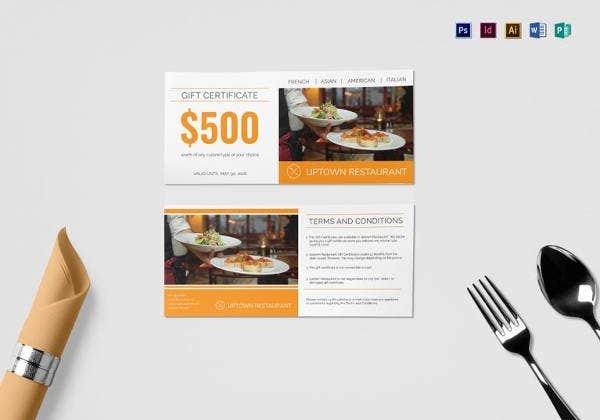 20+ Restaurant Gift Certificate Templates – Free Sample, Example, Format Download! Gifting your sister on her 18th birthday can turn out be a real nightmare for some people. Just sit back and relax. 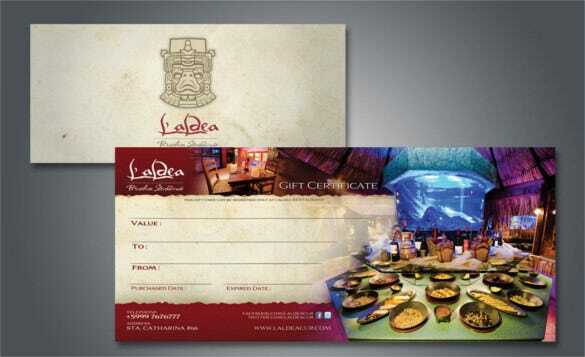 You now have an excellent opportunity to gift amazing restaurant gift certificates. Simply walk into her favorite pizza outlet and ask for a gift certificate. This will be the best gift no doubt if your teen, fat sister is a big foodie. 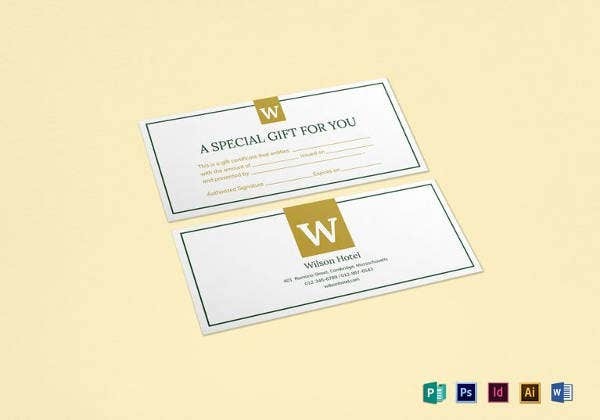 you may Like Hotel Gift Certificate Templates As a restaurant owner you can now easily prepare your own certificates by downloading unique restaurant gift certificates templates offered by us online. 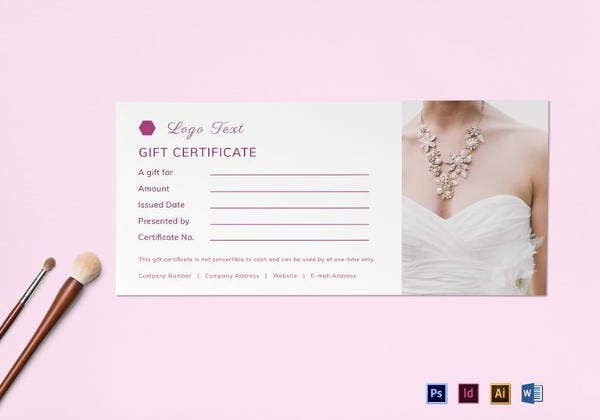 These sample Gift Certificates Templates can be downloaded in any format. Now treat her with her favorite cuisine and get a hug! 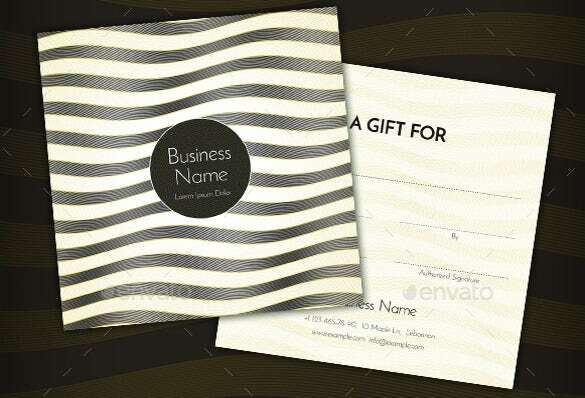 You are getting a 2-sided restaurant gift certificate template here. The front side of the template paints a glam picture of waves in black & white where you can include the name of your company in the middle, inside a circular frame. The back side will contain information about the gift certificate. 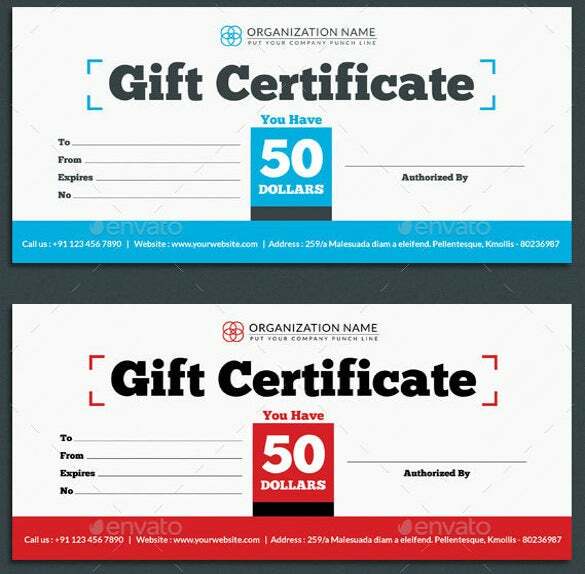 If you are looking for a minimalist style with your restaurant gift certificate without compromising on the elegance quotient, this gift certificate here would be grand for you. It comes with a simple ornate border in black and it would be great for a fitness class and salon services as well, added to restaurant orders. 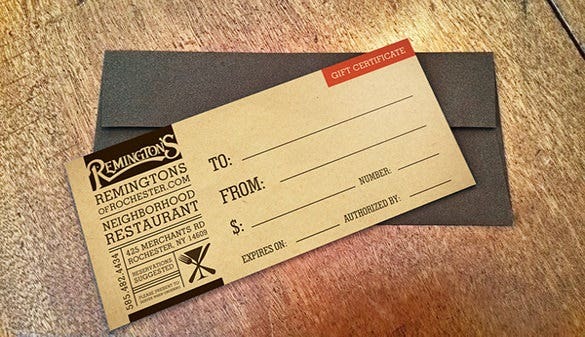 The entire gift certificate has got an old-world vintage feel to it courtesy the faded yellow background. On the left you will include details of the restaurant along with name, address and logo. 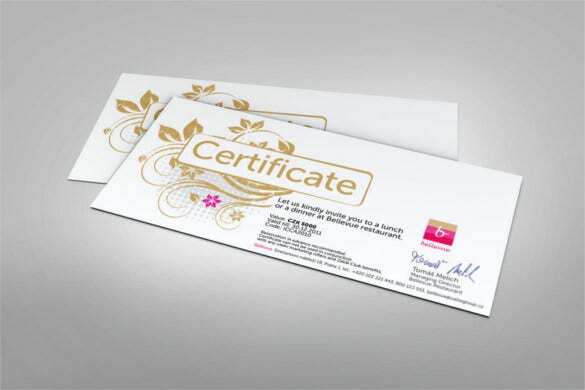 The right side of the certificate is all about the details regarding the gift certificate such as gift value, expiry date etc. 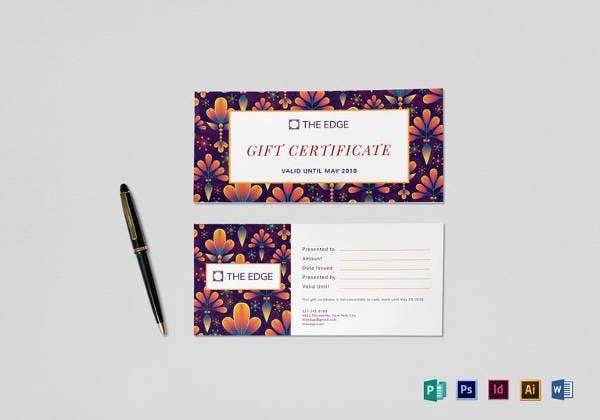 This is a simple yet classy restaurant gift certificate template here – the left side will embody the information of the restaurant- such as its name, address & phone numbers. 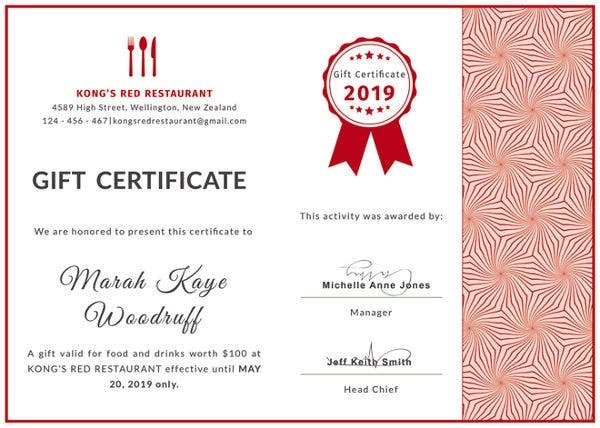 On the other hand, the right side hosts the details of the gift certificate, such as gift amount, date as well as authorization from the restaurant. 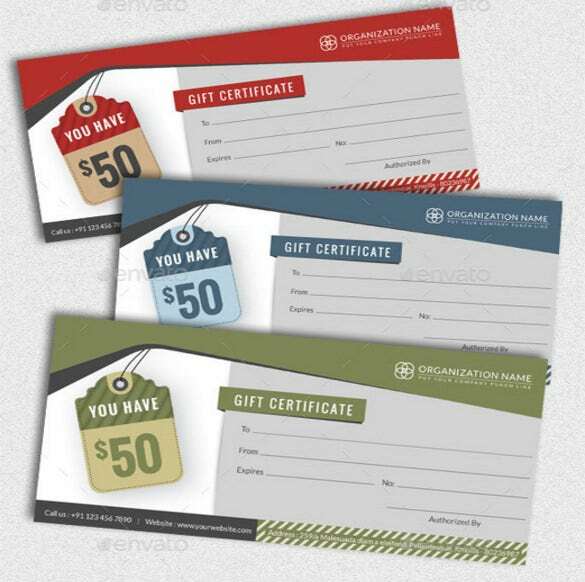 You are getting a neat and smart restaurant gift certificate here with a formal touch all over. The template is available in 3 color combinations and the gift value is $50. 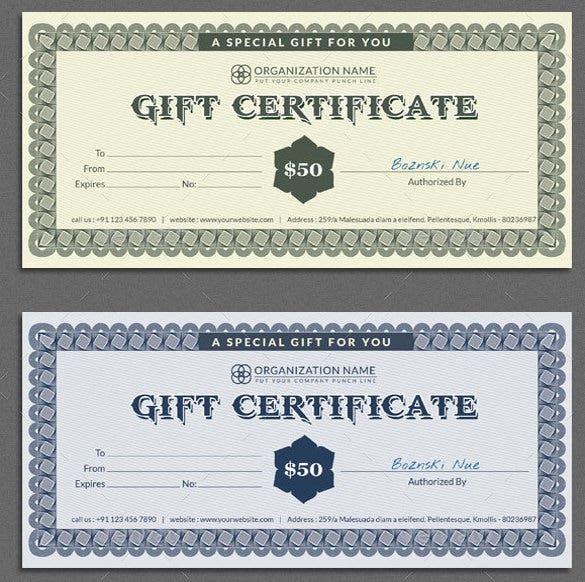 It’s an easily modifiable gift certificate which you can customize just as per your specific restaurant gift certificate details. 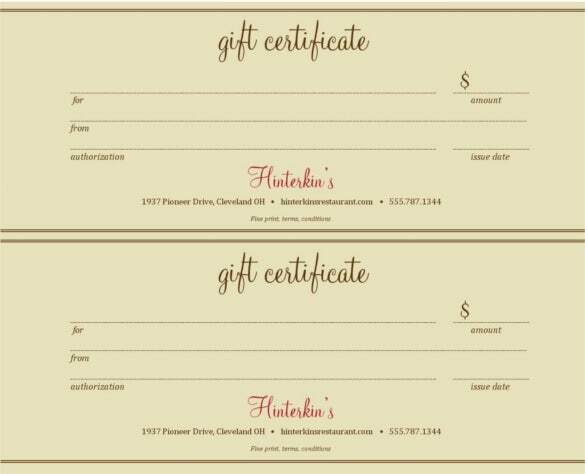 This Italian restaurant gift certificate looks inviting with its tempting picture of sassy Italian delicacy- a restaurant gift certificate has never been this perfect. 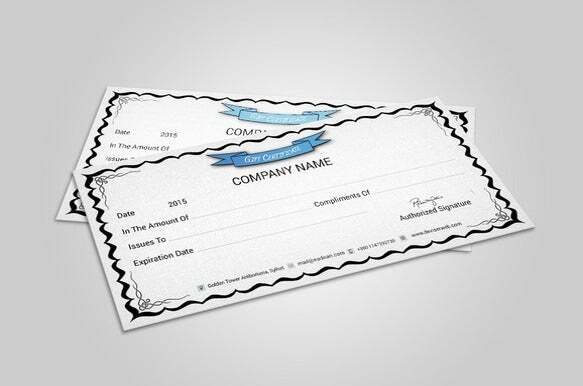 Every part of the certificate can be edited easily according to your certificate details. The red and green combo on the left and right make a vibrant view together.